Illinois singer/guitarist Jackie is an 18-year-old who splits time between being a waitress at Olive Garden and crafting bedroom pop/rock with producer Tombo under the guise of Family Reunion. 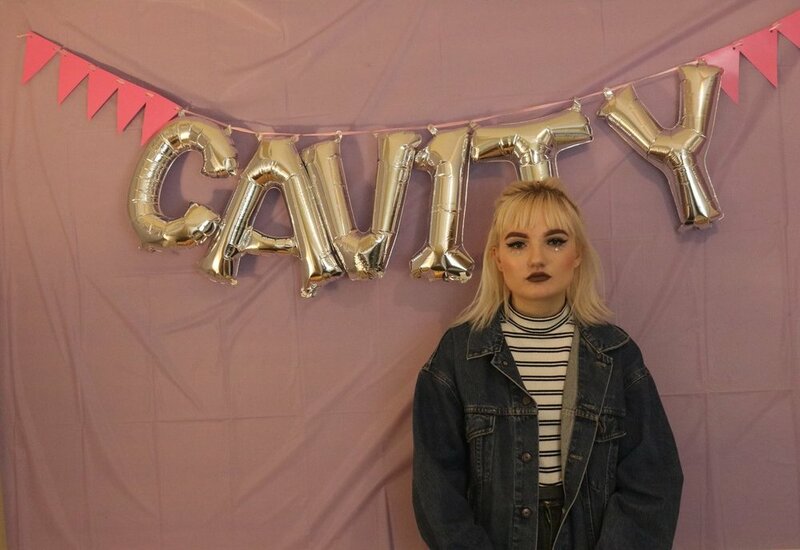 Recorded entirely at Tombo's place, Family Reunion recently released the five song EP, J, which showcases her catchy style of guitar-driven alternative music, perfect alongside a cheap beer and a shared cigarette at a basement party. I spoke with the buzzing artist about her history with music, finding the time to be creative with a full-time job, and the scene in her hometown of Waukegan. A lot of good things and a lot of bad things happening all at the same time. How would you describe your new project to a stranger on the street? An 18 year old girl with a guitar that records in her friend’s room. How long have you been working on this EP? We started working on the EP in November. What is the origin of Family Reunion? My friend was having a birthday party and wanted me to play it, so I wrote a few songs. At the time, I didn’t have any intention to ever use those songs again. People at the party liked the songs, so I decided maybe I should try recording them and putting them out. I wanted to write music that somebody like me, three years ago, would want to listen to. What was it like working with Tombo on this EP? Was it done entirely in person or via email? It was entirely in person. I don’t think I would work well entirely over email. I need to be in a room with someone to reach my full creative potential. We have a few shows booked, plans to release a lot more music, and since I’m not in school I want to take this opportunity to travel as much as I can. I noticed on Twitter that you work at Olive Garden. I've worked in two different Olive Gardens in Indiana over the course of two years. Is it hard to mix music and passion projects with unlimited soups and salads? Honestly, It’s really hard working a full-time job, and being an artist. It’s not fun. At least, I don’t know about your Olive Garden, but mine is not the nicest. It’s not something I look forward to everyday. A good thing that comes from it, aside from the food discount, is I’ve learned to manage my time with music better. Are you located outside of Chicago? What city? What's the music/art scene like in your town? I live in Waukegan. To be honest, we don’t have the biggest art scene, but there are people. When I was in high school, I was afraid to tell people what I wanted to do [music], because I was afraid that people would look down on me for it. Teachers would push the idea of going to college on me so I just kept quiet about my plans. Recently, however, a lot of people from my town have been talking about my music and supporting me and I’m very grateful. I actually played at my old high school’s dance last January and people were singing along. I have a few close friends here who are also artists. We try to hang out as much as possible to motivate each other and to keep going. My most recent favorite TV show is Nathan For You and Hell’s Kitchen. I’ve been listening to a lot of artists from the area like Omar Apollo, VICTOR!, and Adot. I’ve also been listening to a lot of Michael Seyer, Rejjie Snow, and Frank Ocean. Avoid stagnancy. You’re your own worst critic. Be confident in yourself. I’m finally in a place right now I would say the younger me would be proud of and that’s all I’ve really wanted to accomplish. I didn’t even own my own guitar this time last year. I’ve come a long way.